Ideally, you would get a poster framed before gifting it, but if you don’t, you’re still going to have to protect it somehow. One option is to roll up the poster and put it in a mailing tube. The second way is to leave it flat; it ends up being a larger gift, which can be so much fun to open. Using a ruler and utility knife, first cut the cardboard to size, making it two to four inches larger than the poster on all sides. Depending on the size of your poster and your cardboard, you may have to attach two pieces of cardboard together to create a larger piece. Once you have your two pieces, sandwich your poster between them, then tape the cardboard together on all sides. You’re poster is now ready for wrapping. So timely and appreciated! This will inspire a lot of people to go for gifts that are different… so great! 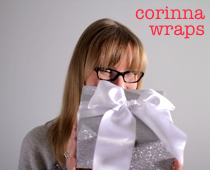 Dear Corinna… I reblogged your info on your blog to mine, and I hoped that you agree with that. I didn’t see anywhere that I did not have permission. Please let me know if you would rather I not reblog… I just want to make the exposure great for everyone. Of course! Thanks for sharing!